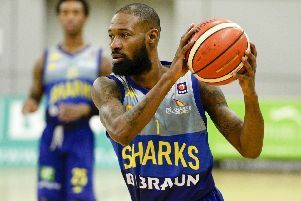 It was heartbreak for the Sheffield Sharks in Glasgow on Sunday as they were edged by Leicester Riders in the British Basketball League Trophy final. With three seconds remaining and following an incredible Sheffield fightback from as many as 17 points down, Chris Alexander’s three-pointer - which would have forced overtime - twice bounced off the rim but did not drop, giving Leicester with their third consecutive BBL Trophy final win. It was a cruel way for a thrilling final to end for Atiba Lyons’ side who, led by a scintillating second-half performance from Alexander, came mightily close to repeating their 2013 Trophy final victory over the Riders. Leicester lived up to their billing as favourites early on, a slow start from Sheffield coupled with some sharp Riders offense putting Leicester into a double-figure lead. Indeed, misses from Dirk Williams in the opening minutes epitomised an out-of-sorts Sharks start, but two fine plays from captain Mike Tuck on the back of some fine Sharks transitions brought Sheffield back to within touching distance midway through the quarter. However, as has been the case so often this season, the Riders exploded towards the end of the first period to go in at a commanding 29-15. The second period proved far more promising for Sheffield - despite another Leicester onslaught in the opening minutes of Q2, a 15-5 spell midway through the period brought the Sharks back to within touching distance, Dirk Williams and Rob Marsden at the heart of things for Sheffield. Misses from the free throw line, coupled with profligacy from beyond the arc, however, hampered the Sharks’ efforts at hauling back Leicester’s lead, Sheffield going into half time down by 11 at 52-41. An even start to the third saw Leicester’s lead remain intact before a 10-0 Sharks charge brought it back to a five-point game. In the blink of an eye, though, Leicester again established a 10-point lead before baskets from Tuck and McKnight kept the Sharks within striking distance at 73-64 at the end of the third. The first three periods gave no indication of what was to come in the fourth, however. Sheffield flew out of the blocks, an 11-2 spell from nowhere edging them in front for the first time, superb play from the red-hot Alexander giving Sheffield the lead. The two sides traded the lead countless times as the clock wound down, a huge drive and finish from Alexander edging the Sharks ahead once more - but it was a stunning three-pointer from Eric Robertson, consolidated by a free-throw from JR Holder which put the Riders clear with 30 seconds left. And with three seconds on the clock, Chris Alexander’s arcing triple bounced once, bounced twice off the rim - but didn’t drop, before a Sheffield foul put Shane Walker at the line, his two free-throws bringing to a close a stunning Trophy final. Sharks scorers: Alexander 20, Tuck 17, Marsden 16, Williams 13, McKnight 11, Wroblicky 5, Gachette 3.